The Race 3 Wardan Whip prizes have been awarded to the top three winning teams at a prizegiving event in Albany. An Aboriginal elder opened the ceremony at the White Star Hotel, and didgeridoo player Graham Simpson also welcomed the teams to Albany, Western Australia. The Mayor of Albany, Dennis Wellington, then congratulated Albany sailor and PSP Logistics round the world crew member Nicola Edwards for taking on the challenge after seeing the race in Albany during the last stopover and being inspired to do it herself. Nicola was presented with flowers by the City of Albany after arriving into her home port this morning. 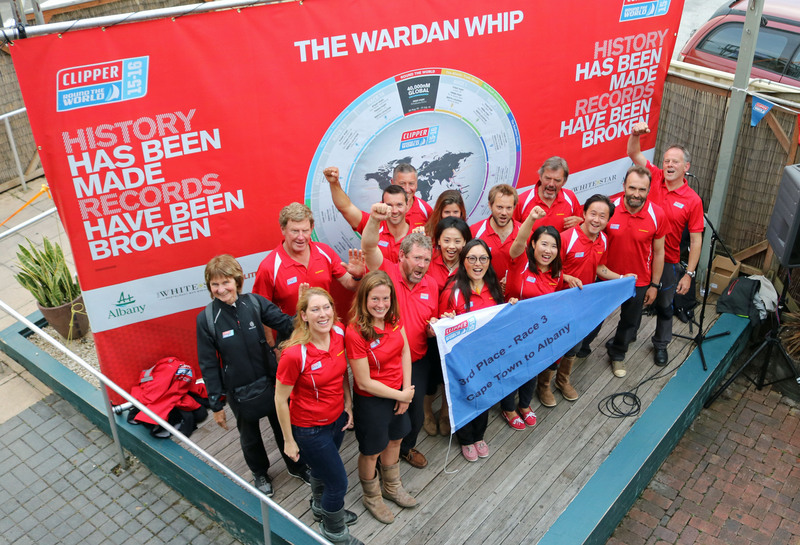 LMAX Exchange received its winner’s pennant for Race 3 victory, with Derry~Londonderry~Doire claiming the second-place prize and Qingdao getting the third place pennant. The Mayor of Albany, Dennis Wellington, handed over the Wardan Whip, a blue glass trophy shaped like a yacht, to LMAX Exchange. As well as the Race 3 pennants, the Stormhoek Social Spirit Award was given out. It went toVisit Seattle for its school project. 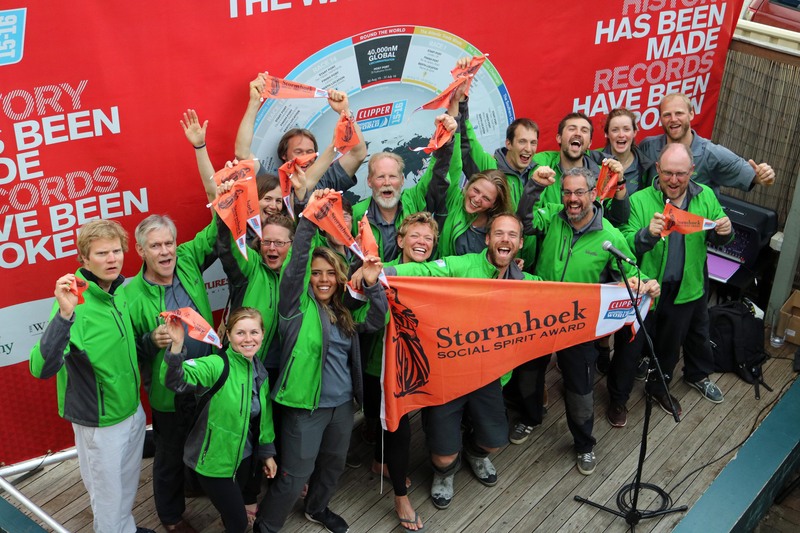 Clipper Race Alumni Sue Fontannaz of Stormhoek said choosing this race’s Stormhoek Social Spirit Award had been nearly as challenging as the race itself. “There’s been some stiff competition – Unicef has shown true resilience and also hit its fundraising target of £20,000 during the course of the leg,Garmin Skipper Ash’s engagement with school children in daily blogs and strong spirit from Da Nang – Viet Nam and the Legenderry social spirit of Derry~Londonderry~Doire were compelling. 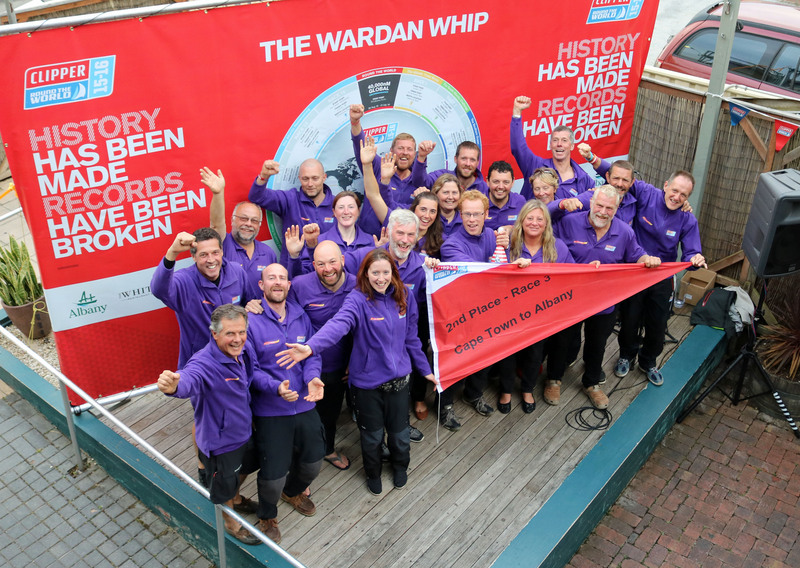 “But the judges are unanimous – the award goes to Visit Seattle who have inspired us with their great Jan Op Zee school project reaching over 30 primary schools (800 children), the consistent support of their followers who are great ambassadors for team spirit, and the crew and Skipper Huw who consistently celebrate the joy of sailing as a team,” Sue added. Race 4: The Elliot Brown Timekeeper Cup from Albany to Sydney will start on Tuesday 1 December. British watch company Elliot Brown is the Official Timekeeper for the Clipper 2015-16 Race. Built to go the distance during the circumnavigation, Elliot Brown watches are being worn by Skippers and crew to test their durability in the extreme conditions. Elliot Brown is producing 1000 special edition Clipper Race crew member watches which are available to pre-order today.